Family drama “God Bless the Broken Road” arrives on Blu-ray™ Combo Pack (plus DVD and Digital), DVD, Digital and On Demand December 4 from Lionsgate. NO MATTER WHERE LIFE TAKES YOU…FAITH TAKES YOU FURTHER. SANTA MONICA, CA (October 16, 2018) – Experience the uplifting family film with Jordin Sparks (Sparkle, Left Behind) and NFL Pro Football Hall of Famer LaDainian “LT” Tomlinson when God Bless the Broken Road arrives on Blu-ray™ Combo Pack (plus DVD and Digital), DVD, Digital and On Demand December 4 from Lionsgate. Dove-approved for all ages and directed by Harold Cronk, the acclaimed director of the films God’s Not Dead and God’s Not Dead 2, the faith-based film tells an inspirational tale where faith, family, friends, and the brave soldiers who serve in the United States military are paramount. God Bless the Broken Road also stars Lindsay Pulsipher (TV’s “True Blood,” TV’s “Law & Order,” TV’s “Justified”), Robin Givens (God’s Not Dead 2, TV’s “Riverdale,” TV’s “The Bold and the Beautiful”), Gary Grubbs (TV’s “The X-Files”), Andrew Walker (Steel Toes, TV’s “Against the Wall”), Kim Delaney (TV’s “NYPD Blue,” TV’s “Army Wives”), and Makenzie Moss (Steve Jobs, Do You Believe?). God Bless the Broken Road tells the inspirational story of a young mother who loses her husband in Afghanistan and struggles to raise their young daughter in his absence. The film focuses on the importance of faith, friends, and family, while paying tribute to those who serve in the United States military. Take home God Bless the Broken Road and go behind the scenes of the making of this miraculous tale with three never-before-seen featurettes, offering exclusive interviews with the cast and filmmakers. 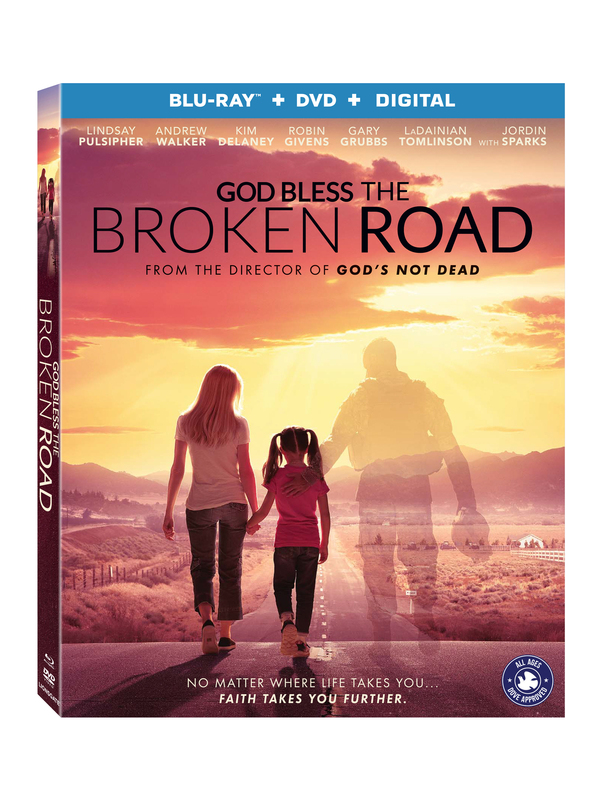 The God Bless the Broken Road Blu-ray™ Combo Pack and DVD will be available for the suggested retail price of $24.99 and $19.98, respectively. Title Copyright: © 2016 10 West Studios, LLC. All Rights Reserved. Rating: PG for thematic elements and some combat action.